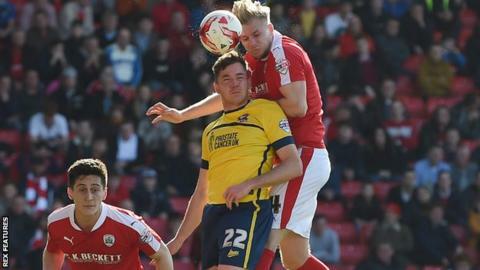 Scunthorpe extended their unbeaten run to seven games by holding play-off-chasing Barnsley to a draw at Oakwell. The Iron, under new manager Graham Alexander, dominated a scrappy first half as goalkeeper Adam Davies saved George Williams' low effort and Jim O'Brien twice shot wide. Conor Hourihane came close for Barnsley after the break but goalkeeper Luke Daniels tipped his effort over the bar. Josh Brownhill's strike in the final minutes then went wide for the Tykes. The draw keeps Barnsley in the final League One play-off position, just one point ahead of Bradford City. "We were the better team in the first half. We caused some problems and mixed the play up really well when we had possession. "I don't think some of the decisions helped. There were too many nothing 50/50 goings against us. But I want to have a good relationship with referees and he was good enough to have a proper chat with me. "For the team and the players the effort was fantastic. You could see the determination to get a result." Match ends, Barnsley 0, Scunthorpe United 0. Second Half ends, Barnsley 0, Scunthorpe United 0. Shaun Tuton (Barnsley) wins a free kick in the defensive half. Jack King (Scunthorpe United) is shown the yellow card for a bad foul. Attempt missed. Josh Brownhill (Barnsley) right footed shot from outside the box is close, but misses to the left. Hand ball by George Williams (Barnsley). Substitution, Scunthorpe United. Scott Laird replaces Jamie Ness. Substitution, Scunthorpe United. Jack King replaces Luke Williams. Corner, Scunthorpe United. Conceded by Josh Brownhill. Corner, Barnsley. Conceded by Conor Townsend. Josh Brownhill (Barnsley) wins a free kick in the defensive half. Corner, Scunthorpe United. Conceded by Conor Hourihane. Attempt saved. Ivan Toney (Barnsley) header from the centre of the box is saved in the centre of the goal. Corner, Barnsley. Conceded by Paddy Madden. Corner, Barnsley. Conceded by Jamie Ness. Attempt saved. Marc Roberts (Barnsley) header from the centre of the box is saved in the top centre of the goal. Corner, Barnsley. Conceded by Luke Daniels. Attempt saved. Conor Hourihane (Barnsley) left footed shot from outside the box is saved in the top centre of the goal. Ivan Toney (Barnsley) wins a free kick in the defensive half. Substitution, Barnsley. Shaun Tuton replaces Harry Chapman. Attempt missed. Luke Williams (Scunthorpe United) right footed shot from outside the box is close, but misses to the right from a direct free kick. Foul by Marc Roberts (Barnsley).